Sarah’s Mom, Fiona sent us this wonderful video today. It has been split into two parts. Click below to view. Sarah, now 23 years of age, was diagnosed with systemic Juvenile Idiopathic Arthritis (JIA) as a baby. She was plagued with a multitude of disorders from 6 months old. Sarah was malnourished and found it very difficult to absorb any nutrients. For years she required IV TPN and lipids or a feeding tube. Sarah saw no relief and in her early 20s her health continued to deteriorate. That was until last November (2014) when she received her first high dose infusion of mesenchymal stem cells. Following her stem cell treatment (that she received in Mexico), Sarah had an immediate surge of energy and actually felt hungry and enjoyed a meal for the first time in years. By month two (January 2015), her digestive disorder was totally resolved. Her doctors are so impressed with her response they are writing a study and a peer review publication is set to be released shortly. Sarah is scheduled to receive more of her own adult stem cells (mesenchymal stem cells) over the next few months. At the six month mark Sarah has a new lease on life. She is riding horses, swimming, taking college courses and spending time with her friends for the first time ever. Before Sarah received her stem cell treatment she was on high dose chemo and 23 maintenance drugs. Her drug intake is now down to 15 and this number is continuing to be reduced. Here Sarah and her Mom, Fiona explain in detail Sarah’s journey of recovery. When it comes to adult stem cells, discoveries to date and possibilities in the near future are endless. One’s own adult stem cells are the building blocks of our entire body. They have the capability to repair, renew and recharge our blood, tissue, cartilage, healthy cells, immune system, nerves, skin, tendons, muscle and organs. It is impossible to read about the breakthroughs and not marvel how remarkable these scientific discoveries are. Below we share a snapshot of remarkable stem cell discoveries that have emerged in the last month. Although a stem cell transplant remains a delicate procedure, success rates are rapidly improving. There are two main types of stem cell transplants: autologous, in which the patient receives his or her own stem cells, and allogeneic, in which stem cells are donated by another person. With many global stem cell registers now available, an exact match is now possible for those that require donated stem cells, and with sophiscated technology and equipment, along with proven clinical data the overall process has become a lot more streamlined and effective. Def Leppard guitarist Vivian Campbell has returned home after undergoing stem-cell treatment in his continuing battle with Hodgkin’s lymphoma. Tammy McLash (pictured above) of Regina, Canada was diagnosed with acute myeloid leukemia in August. Doctors told her she needs a stem cell transplant to survive. After months of searching, a match has been found. Tammy, 38, grew up in Regina and now lives in Edmonton with husband Mat and their two year-old twins, Adam and Madeline. 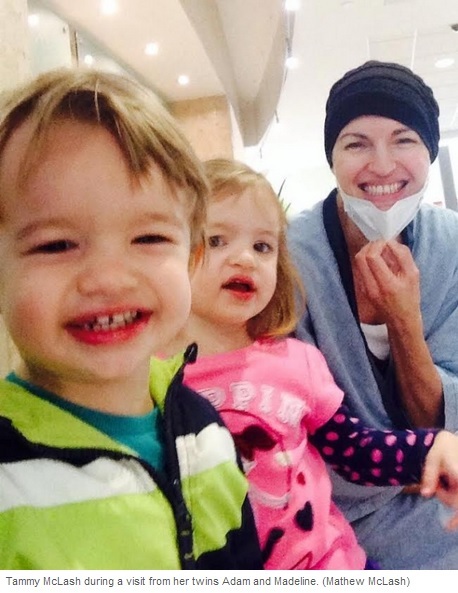 Tammy’s cancer has prevented her from spending a lot of time with her kids. Tammy has been undergoing chemotherapy as she must be in remission before the stem cell transplant can take place. The transplanted stem cells – called olfactory ensheathing cells (OEC) and olfactory nerve fibroblasts (ONF) – were taken from cells in the brain which control the sense of smell. Scientists in Poland were able to then grow the stem cells and inject them into Darek Fidyka’s completely severed spinal cord. “This is more impressive than a man walking on the moon,” said Dr. Geoffrey Raisman, a professor at London’s Institute of Neurology’s University College and one of the study’s authors. Dr. Charles Tator, a neurosurgeon at Toronto Western Hospital, told CTV News Channel what is so remarkable about OEC and ONF cells is that they have the ability to regenerate fast. Tator said OEC and ONF cells have been studied for spinal-cord injury over the past 15 years. What is new, he said, is “mixing those cells with the graph of the peripheral leg with the same person, so they’re not being rejected is a novel combination. This week Rafael Nadal’s doctor says the 14-time Grand Slam winner will receive stem cell treatment on his ailing back. “Nadal has a problem typical in tennis with a back joint, he had it at the Australian Open, and we have decided to treat it with stem cells,” Ruiz-Cotorro said. This month a research team from The Jackson Laboratory in Connecticut said they have gained a better understanding of the inner workings of the still emerging concept of lung regeneration. Reporting on the role of certain lung stem cells in regenerating lungs damaged by disease, the study (referred to as the p63+Krt5+ distal airway stem cells are essential for lung regeneration”), published in Nature, points to therapeutic strategies that harness lung stem cells. Dr. McKeon and his colleagues had previously identified a type of adult lung stem cell known as p63+/Krt5+ in the distal airways. In the new paper, published November 2014, the research team reports that the p63+/Krt5+ lung stem cells proliferate upon damage to the lung caused by H1N1 infection. Following such damage, the cells go on to contribute to developing alveoli near sites of lung inflamation. Alveoli are tiny sacs within our lungs that allow oxygen and carbon dioxide to move between the lungs and bloodstream. The scientists also showed that when individual lung stem cells are isolated and subsequently tranplanted into a damaged lung, they readily contribute to the formation of new alveoli, underscoring their capacity for regeneration. In the U.S. approximately 200,000 people have Acute Respiratory Distress Syndrome (ARDS), a life-threatening lung condition that prevents enough oxygen from getting to the lungs and into the blood. This disease has a death rate of 40%, and there are 12 million patients with COPD. The researchers hope their research will lead to new ways to help those with lung conditions and disease.